Weird superstitions aren't the only thing you'll encounter on Friday the 13th. Across the country, tattoo shops are about to embark on a tattoo marathon. Popularized by Oliver Peck in Dallas, Friday the 13th tattoos are something of a holiday at shops around the country. Parlors will set out flash sheets -- a sheet or book of pre-drawn tattoo options -- often designed by artists in-house. Those drawings are available as cheap, quick tattoos that have people lining up for hours. Be sure to be good to your artist if you're going under the needle. That should go without saying. However, it's especially true when artists are offering cheap tattoo deals for the 13th. 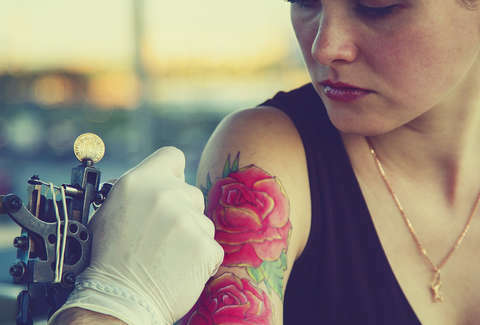 Artists often aren't making much on your tattoo because of the steep discounts. "The shop doesn't make $$ on Friday the 13th," New York's Daredevil Tattoo notes on its site. "It actually cost us $$ and we are very tired at the end of the day so we really appreciate nice words and any nice reviews you can leave for us online." So, be sure to tip. Paul Collurafici of Chicago's Tattoo Factory advises that you should "watch out for shortcuts." Participating shops are going to be going through a lot of customers throughout the day. "Counters and chairs should be wiped down with sani-wipes after every tattoo," he says. "Needles and tubes should be in sealed sterile packages and opened in front of [you]. New ink poured out while [you] watch." You can pick from one of two designs and get a tattoo for $130. They're larger than the usual Friday the 13th fare. 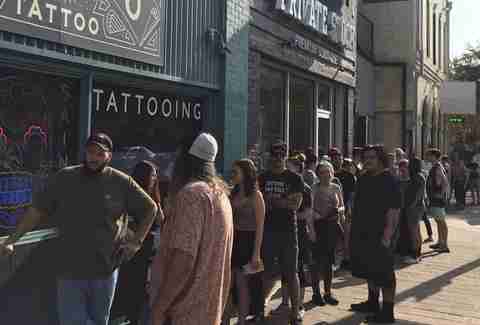 The shop goes through about 300 people on the 13th, according to Hardy, who acknowledges that the events can be divisive inside the tattooing community. Some people think it "cheapens the craft and brings out the wrong type of clientele," he says. "For me personally, it’s my favorite event of the year. I’ve been tattooing for 11 years and doing Friday the 13th tattoos for about the past seven or eight years. I charge $13 for designs that are usually at most about 2 inches in diameter. Some shops do $13 plus a $7 mandatory tip, but to me that kind of defeats the purpose of it being a tip and most people still give you $20 anyways. " The ATL shop is offering $13 tattoos with a mandatory $7 tip all day. Pick art from a flash sheet and grab a slice of pizza in the shop while you wait for your turn under the needle. Shop owner Jon Reed has more than 350 designs to choose from. Each full-color tattoo costs $31. All Saints has been doing a Friday the 13th special for five years and frequently has a line out the door. The inking starts at 10am and runs until 2am. Friday the 13th specials will vary by the artist at Amillion. Some are $13 (w/ $7 tip), some are $31, and others are $130. The shop offers walk-ins tattoos from noon to 8pm. The designs come in $80, $100, and $120 levels. The shop will start tattooing at 11am and only takes walk-ins. It also teased a $25 beer, pizza, and tattoo combo of some kind. The shop is offering $13 tattoos with the lucky $7 tip, according to a post on Dream City's Facebook page. You can pick up a tattoo for $13 (with $7 tip), $31, or $66.60. The prices vary by size. Get a $31 tattoo (with a $9 tip) or $13 piercings ($7 tip) at Jade Dragon. What's special here is you can pick from their pre-drawn designs or you can design your own "as long as it's similar to our designs." Pick up a $35 tattoo off Krol's flash sheet from 1-8pm. Though, a representative tells Thrillist the "price is subject to change." Based on the size, tattoos are either $13 (plus a $7 tip) or $31 (plus a $9 tip). The flash sheet will be revealed on the 13th, and people "tend to show up right at or a little before noon," says a representative. The tattoos will roll until around 6:30. The shop on Clark St. offers $13 tattoos (with a $7 tip) from a book with around 30 pages of flash options. It also offers its popular $31 Halloween tattoos for Friday the 13th. "People always ask for it," owner Kevin Owings tells Thrillist. The flash sheets aren't posted online in advance, and the shop recommends arriving early because it gets busy. The deal du jour is $31 tattoos and piercings. You can bring in your own design as long as it's ready to go. They also won't do midsections or anything above the neck during this promotion. The shop co-owned by Peck runs a 24-hour tattoo marathon every Friday the 13th. If you want to make sure you get in, you can sign up for a spot on Thursday. Otherwise, the line starts forming just before things kick off. During Lifetime's "Lotto" event, you can pay $60 and "get what you get." Alternatively, you can step up to $100 and pick your own image from the flash sheet. The shop will be offering tattoos from two artists who are taking currently taking appointments, according to a post on Battle Royale's Facebook page. The flash sheet features $100 palm-sized tattoos. As it does every Friday the 13th, True Tattoo is open for a full 24 hours starting at midnight. The basic flash sheet contains tattoos for $13 with a mandatory $7 tip. However, it's changing things up a bit this time, allowing people to sign up in advance for larger tattoos. Advance sign-up lasts until July 11. As they do every Friday the 13th, Atomic is offering cheap tattoos. They occasionally post the flash sheets the day of and sometimes you'll just have to get in line to see what's available. The shop is offering tattoos from a flash sheet that won't be revealed until the day of the promotion. The first-come-first-served tattoos cost $13 each with a mandatory $7 tip. For the reasonable price of $31, you can pick a design from flash sheets designed by artists at Minneapolis Tattoo. The Murfreesboro shop will have $20 tattoos, according to its Facebook page. The shop goes all-in on the "holiday," offering tattoos for "$13 and a lucky $7 tip." Daredevil, which has done this for 15 years, opens around noon and people can add their name to the waiting list at that time. Tattoos are pretty much limited to arms and legs and will come off a flash sheet that's revealed the day-of. More details here. 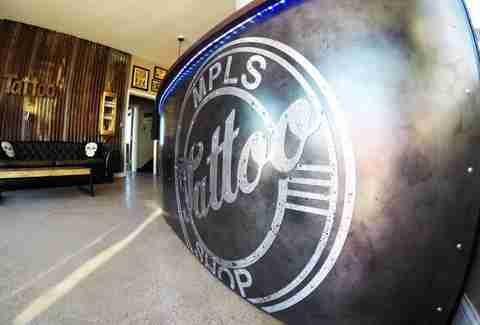 Magic Cobra is offering palm-sized tattoos at a $100 a pop from noon until 10pm. It's a first-come-first-served affair. The shop offers flash specials, which are custom designed by each artist, starting at $50. "For the past several events we've had," the shop tells Thrillist, "we've had people waiting outside, lined up down the block by 11am." Hunter Gatherer only does the flash sheets on a first-come-first-serve basis and you can only sign up for yourself. Body piercings are also $10 off until 8pm with a maximum of three piercings per person. The Moo promotion runs all weekend. You can pick from their designs or bring in your own and get a $31 tattoo. You must register in advance and there are limited appointments for $130 "VIP" designs, according to the shop's Facebook page. Both Portland-area locations will be offering first-come-first-served $31 tattoos and $13 piercings. Though, piercings are decided on by the ominously-named Piercing Wheel of Destiny. A percentage of the shop's proceeds will be donated to RAICES, the Refugee and Immigrant Center for Education and Legal Services. The shop is running a Friday the 13th special on Friday and Saturday from noon to 9pm and Sunday from noon to 7pm. Starting at noon and running "until we get tired," you can select designs from a custom flash sheet and get a tattoo for $60. Available designs will be posted to Instagram by each individual artist at Moth and Dagger. Grab a $20 tattoo at Iron Age. They'll tease the flash sheet online, but you'll only be able to see the full thing if you stop in. Friday the 13th Tattoos in Washington, D.C. The shop has 13 designs available for $31 each. "We usually have a pretty big turnout, so we advise folks to arrive earlier rather than later," a rep tells Thrillist. The event runs from 2-7pm. It's cash only, one tattoo per person, and the designs will be posted to the shop's Facebook page 24 hours before the 13th.